This superb article emphasizes the very high importance of a team approach when undertaking CT dose management. This interesting article documents both the degree of CT dose reduction from model-based iterative reconstruction and improvement in image quality when looking at lung parenchyma detail. This study further validates that model-based iterative reconstruction can decrease CT exam dose by 50-80% without compromising diagnostic power. There now is a substantial accumulation of published reports of this type in multiple body areas and organs. The same is becoming true for blended types of adaptive statistical plus model based (minus the optical components) iterative reconstruction (such as ASIR-V). This study illustrates how iterative reconstruction techniques can be used to lower the radiation dose when using CT to search for urinary tract stones – without compromising accuracy significantly. The risk from medical diagnostic radiation in doses below 50 mSv as a single dose or 100 mSv as a cumulative dose is too small to be measured and may be non-existent. This article illustrates how much good diagnostic information can be obtained using very low CT radiation doses when screening for lung nodules. In the screening environment, doing no harm is especially important since so many patients are screened. But detection rates cannot suffer. Here is encouragement that we can meet both goals with very low dose CT combined with iterative reconstruction. This article pretty well confirms what many have felt: model-based iterative reconstruction (MBIR) lowers radiation dose by 70-80% compared to adaptive statistical iterative reconstruction (ASIR), without loss of diagnostic power/information. While the images do indeed look different because there is much less noise and because of a slightly different pattern in the remaining noise, all the findings are there. Further, the anatomy and the findings are displayed as well or better. So, in a young patient (under age 45) – especially if they are likely to be getting multiple exams – use of model-based iterative reconstruction is well worth the longer reconstruction time. Paying attention to limiting Z axis coverage yields big dose saving dividends! See this article for results of this study designed to assess the safety and efficacy of radiation dose reduction in hospitals lacking iterative reconstruction. This comprehensive article demonstrates the importance of CT dose monitoring and utilizing strategies to achieve ALARA (as low as reasonably achievable) doses while maintaining image quality for optimal clinical diagnosis. The authors also describe how the use of technology can improve the radiation dose efficiency of CT scanners. Radiation Dose Management in CT: Is it easy to accomplish? 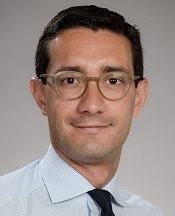 At the AHRA conference in Las Vegas recently, Dr. Pizzutiello, a medical physicist, discussed the complexity of CT radiation management and monitoring in diagnostic imaging. With the growing use of CT exams being performed and radiation dose in CT being a hot topic in the radiology community, it is imperative to monitor radiation dose from the CT exams as well as observe trends over time. Regulations now require that CT dose has to be documented and available on demand, CT protocols be revisited on an annual basis and incidents with high dose CT exams be reviewed. Several states around the US have CT regulations or are in the process of regulation implementation. It is a monumental task to monitor and manage dose, especially for large hospitals. There are several dose management software products available that can help in managing the dose. Dose management is, however, a team effort and it is not possible to do this effectively without a team of radiologists, technologists, and medical physicists participating in this important task. At our institution, we have been managing dose using a commercial product, Dose Watch (General Electric Healthcare) and also have a radiation safety committee within the department to review dose trends and make intelligent decisions based on our dose data. We have also been participating in the ACR CT Dose Index Registry since its inception and review our trends and benchmark values to our peer institutions. This is definitely a good idea if one is unaware of dose trends at their institution and how it compares to others around the nation. Dose monitoring is complex but a necessary patient safety tool and, if well planned, can be accomplished and maintained with the help of dedicated professionals who understand the importance of the task. Size specific dose exposure (SSDE) is a better measure which we will be hearing more about in the near future. This article highlights that it is possible to achieve much lower radiation dose CT scans for commonly employed types of CT studies – the CT for urinary tract stones is one of the most common. While not done everywhere, attention to detail can produce remarkable reductions in patient radiation without compromising diagnostic power. Use of a lower kVp will actually make stones a bit brighter. Careful attention to patient centering in the gantry can make a difference of up to 40% in dose. And the use of iterative reconstruction techniques is now widely accepted to not compromise detection, yet with marked dose reduction – whether it be statistical iterative reconstruction, model based iterative reconstruction, or some blend of the two. Radiologists and technologists both need to understand the importance of these tricks and the physics behind each. 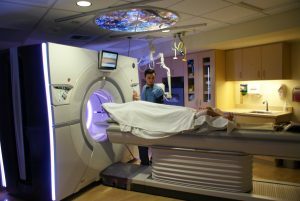 Seattle King5 TV’s Jean Enerson reported recently on UW Medical Center’s installation of the GE Revolution CT scanner. This article illustrates that Radiologists’ perceptions of image quality and content change as they become accustomed – over time – to the different noise pattern of the various types of iterative reconstruction. In fact, no spatial resolution or low contrast resolution is lost with iterative reconstruction techniques – and diagnostic power is maintained. Our work here at UW Medicine agrees with this report. And it is important to know this because iterative reconstruction can result in 30%-60% dose reduction for all types of CT, without loss of diagnostic power. This article outlines the substantial reduction in radiation exposure to body parts which are shielded during a CT scan but not included in the field of imaging. That is a very good practice. More controversial is another practice: shielding sensitive body parts which ARE included in the field of imaging, specifically breasts, thyroid and gonads. For some types of scanners this works well, while for other types less well. With our scanners (GE) IF shielding to the sensitive body part is applied after the scout views are obtained, and IF the shield is separated from the body by placing towels or a blanket to elevate the shield off the body by 2-3 cm – then this works well. Any artifacts or other issues with image quality are minimal or out of the area of interest and the dose to the shielded body part does drop measurably. Further, such shielding sends a strong message to patients and to our own staff about our concern for their safety. 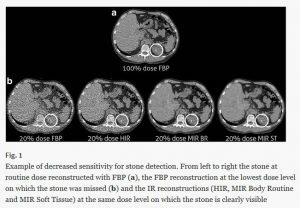 How low can we go in radiation dose without affecting diagnostic confidence for detection of low-contrast liver lesions? In a recent article we published, we studied the impact of incremental increases in CT image noise on detection of low-contrast hypodense liver lesions. Clinical CT liver exams were obtained on a 64-slice CT scanner using automatic tube current modulation at a routine clinical noise index 15. 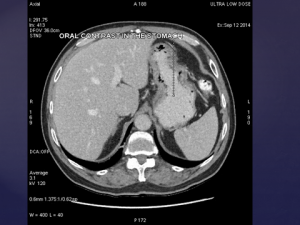 An artificial image noise addition tool was used to increase the noise level in clinical liver CT images to simulate 75% (NI 17.4), 50% (NI 21.2), and 25% patient radiation dose (NI 29.7) scanning relative to the original images (NI 15.0; 100% dose). The images were reviewed by radiologists of varying experience who subjectively scored lesion detectability on all the images, original and simulated. We concluded that there is little loss of detection sensitivity for low-contrast liver lesion detectability of CT exams scanned with a NI at least up to 21.2 compared to a NI of 15, a patient radiation dose reduction of 50%. No significant degradation was observed when reader performance was evaluated as a function of lesion size (>10 mm) and contrast (>60 HU) at 90% sensitivity. When lesion size dropped to <10 mm or contrast was <60 HU, sensitivity did drop to 85%. This study had some limitations, the most important of which was that this study was a simulation and not a true study of CT scanning at lower radiation dose compared to high dose scanning which would have involved scanning patients multiple times. Nevertheless, this study was important as it demonstrated that dose could be reduced by 50% without affecting diagnostic confidence for detecting low-contrast liver lesions. Since many patients who get CT enterography have repeated exams (inflammatory bowel disease, etc. ), Model Based Iterative Reconstrucion has primarily been used to markedly reduce radiation dose while maintaining acceptable image quality. However, this might be another application – especially if the patient will have only one such exam. This very wise philosophy for implementing iterative dose reduction in any CT program was well presented at the recent MDCT meeting of the ISCT in San Francisco in June. A key component is to have regular and measurable ways for radiologists to regularly grade or score image quality as dose is ramped down slowly with increasing amounts of iterative reconstruction. With Model Based Iterative Reconstruction (MBIR), it may be possible to drop dose up to 60% compared to otherwise low dose adaptive statistical iterative reconstruction methods (ASIR) – but not in one jump. It takes time to get accustomed to the slightly different look of images with iterative reconstruction. At least a month’s worth of experience should accrue before passing judgment on image quality. It is also important to guard against anecdotal cases used to render judgments, so experience over time is important. But with a methodical approach, a lot of progress can be achieved in overall dose reduction. Patients with Crohn’s disease often are young and often have their disease activity assessed repeatedly with CT – though MR is used more frequently now as well. So – they are good candidates for reducing radiation dose by means of iterative reconstruction. This paper demonstrates that considerable reduction of dose can be achieved without damaging image quality. There are some who say that iterative reconstruction should be reserved only for younger patients and not used on older cancer patients who already have serious disease. But many patients with malignancies are younger or are being treated for cure. This article suggests that an iterative reconstruction technique (such as model-based iterative reconstruction, MBIR) which can reduce patient radiation dose by 50% may have salubrious utility in patients with lymphomas – who often are younger, who get multiple CT scans, and who are being treated for cure. This may apply to other malignancies as well. At the 2014 ISCT-sponsored MDCT meeting in San Francisco – dose reduction was a key theme during all four days. Iterative reconstruction was a common theme of an overall dose reduction program. While adaptive statistical iterative reconstruction (ASIR) now has been well-shown to reduce average doses by up to 40% without impact on image quality, the hot topic was model-based iterative reconstruction (MBIR) in its various forms. Consensus is now developing around MBIR being capable of 50-70% dose reductions incremental to adaptive statistical iterations. While image appearance may be somewhat different from that of filtered back projection, it is now pretty clear that such different appearance does not compromise diagnostic power. Indeed, with experience, some radiologists have developed a preference for the image appearance of MBIR. It is often said that radiation from diagnostic imaging is not an important issue in cancer patients. But this report suggests otherwise – as expressed by oncologists. Many patients with cancer are young and/or are being treated for cure. Many have long life expectancies despite having cancer. And the basic principal of “Do no harm” plus that of ALARA still apply – as much to cancer patients as to any other patient with a serious disease. So we should be striving for maximal diagnostic information from minimal radiation dose with CT and other modalities in cancer patients, too. This direction of combining a higher noise index (NI) to get lower dose images and then correcting for the resultant noise by using an increased percent of iterative reconstruction (ASIR) is exactly the way to go when striving towards “as low as reasonably achievable” (ALARA) – in my opinion. At UWMC, we have for a couple of years now gone even further – we use NI in the 30-36 range and routine 70 percent ASIR as a standard for all our CT imaging except high resolution lung (which is NI 25 and ASIR 30%). According to the ACR CT Dose Registry, we are in the bottom 10% of their data base for CT dose….. but the images are very good. Check out this article to learn more. 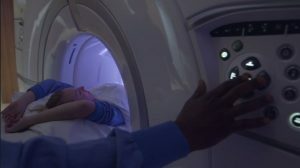 A University of Washington study featured in the August issue of JAMA Pediatrics claims that 4 million annual pediatric CT scans of the head, spine, abdomen and pelvis are predicted to cause nearly 5,000 future cancers, according to HealthImaging.com. However, the study goes on to state that the risk can be mitigated by CT dose reduction and appropriate imaging initiatives which have the potential to prevent more than half of the projected radiation-related cancers. Practices like eliminating unnecessary scans and targeting high-dose scans are called out in the study. I believe that the best way to reduce radiation dose from CT in children is to not do studies which are inappropriate or which have a very low chance of producing impactful diagnostic information. The next best way to reduce dose is to pay close attention to all the tricks of technique: accurate patient centering in the gantry, use of radiation shields, use of 80 or 100 kVp, minimizing Z axis scan length, etc. Then newer technology will greatly further reduce dose – automated tube current modulation, iterative reconstruction – especially fully model-based iterative reconstruction. Together these can reduce radiation dose by 70-80 percent. Scanning in kids above 6-8 mSv should be a thing of the past and sub-1.0 mSv scans should be common. A new study presented at the American Roentgen Ray Society (AARS) meeting brought attention to another key point in radiation dose reduction. Currently, a majority of the focus on cutting CT scan radiation is centered on dosage levels, but it is also important to monitor cumulative dosage in patients receiving multiple scans. While government and industry are increasingly focused on single CT scan dosage reduction (which is great news! ), there is a lesser concern for decreasing the overall number of CT scans for patients. The research tracked the amount of repeated CT exams performed on patients in order to calculate cumulative radiation dosage. Some of the results are shocking. The study identified a group of patients from the test population undergoing more than 20 medical imaging exams in one year, and as a result, being exposed to high cumulative dosage—more than 300 mSv per annum! In fact, one patient received 70 different scans in one year! This is, of course, something we are working to mitigate continuously. Europe (EEU) has been tracking the cumulative dose of its citizens for about 10 years—by law! This is certainly a good thing for patients and in the U.S, we are beginning efforts towards this direction. Several products are now available that serve as a repository for dose from devises and particular protocols, to keep track for individual patients (including cumulative). 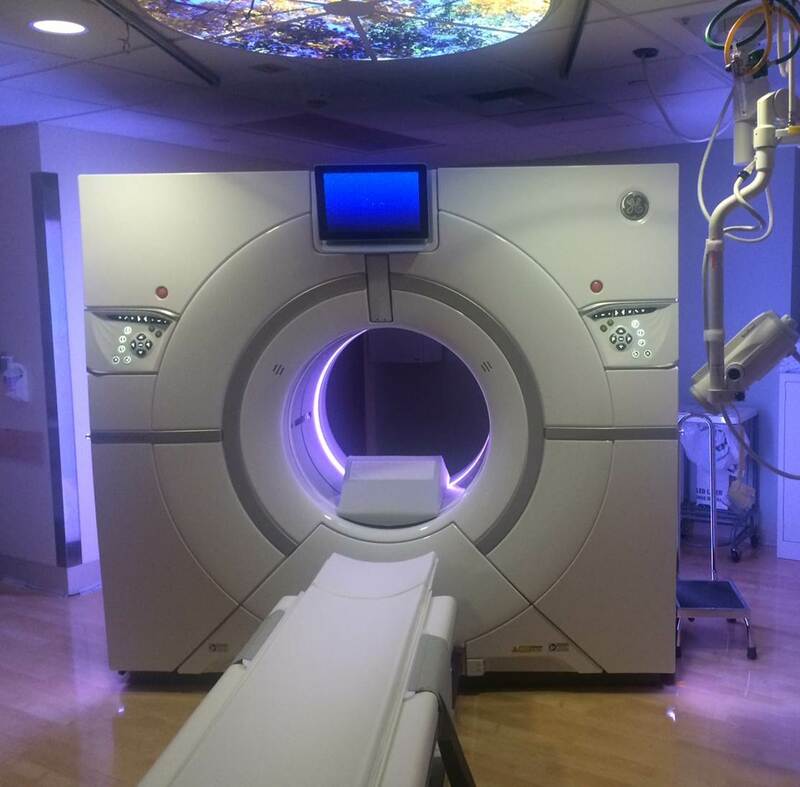 We recently purchased such a product (DoseWatch, GE Healthcare) which will be integrated with our RIS and connected to every radiation emitting device in our medical center. This product will pick up cases of unusually high cumulative dose in patients, but also identify protocols which have high dose or devices which are emitting high dose. We are looking forward to implementing DoseWatch a few months from now. Be sure to check back regularly as we document our experience with the product. Most medical equipment is not designed for obese patient optimization, including diagnostic imaging modalities. Due to this, overweight and obese individuals are subject to higher levels of radiation during routine CT scans and X-rays. A recent study, published in the Journal of Physics in Medicine and Biology, calculated exactly how much additional radiation overweight patients are exposed to from CT scans. According to the research, obese men and women receive 62 percent and 59 percent more radiation during CT scans than normal weight individuals. However, new technology can help control that percentage. 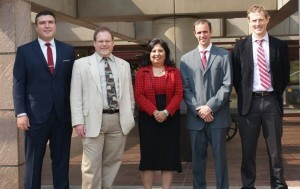 Phantoms, realistic 3-D computer models of overweight and obese men and women, can now be used to determine the risk of radiation scans on different body types. The use of various sized phantoms to study CT dose distribution within the human body is a very scientific approach when considering the effects of CT. This technology will be able to accurately tell radiologists how much radiation patients receive from different devices so that they can make the safest and optimal choice for the patient. Notice, this article highlights the significant increase in radiation dose—especially in obese patients—from increasing kVp to 140. At UW, our technologists use 140 kVP for CT only after having a conversation with a radiologist about each specific case. Learn more about the use of phantoms for obese patients here. Check out this interesting story, “Radiology Helps Unwrap Mummy Mystery,” about a radiology lab helping out a university museum with some mummy research. They were hoping that, through the use of CT scans, they’d learn some valuable information about the mummy and the person he once was. Amusing, isn’t it? Dead people are willing to pay the price for images that look too good: high radiation. A new method of extracting and archiving patient CT dose information has been developed, according to a recent article in Science Daily. Called RADIANCE, this new system should help with compliance with the American College of Radiology’s reporting guidelines and build greater awareness of radiation dose to patients. It is clear that we are headed toward the recording of radiation dose from each CT scan in the patient’s medical record. Initially, this will be in the PACS archive, then in the radiology information system (RIS) on the way to being in each radiology CT report. Eventually, the dose will reside in each patient’s electronic medical record (EMR) and a cumulative record as well – just as they do in Europe today in the EEU. RADIANCE is a big step in that direction. Does Variability in CT Dose from Multi-Detector CT Scanners Matter? CT radiation dose has recently been in the limelight, not only in the news media but also for patients undergoing CT exams. Estimating CT dose is complex and further challenged by the different types of CT scanners available in the market today. In a recent study, investigators collected CT radiation dose measurement data from all the multi-detector CT (MDCT) scanners used in the National Lung Screening Trial. Radiation dose in CT is defined as CT Dose Index (CTDI). CTDI represents the average absorbed dose, along the length of the patient’s body from a series of contiguous scans. Normalized CTDI can be used to determine the efficiency of the CT scanner, and finally the dose imparted to patients. Normalized CTDI represents the dose per mAs (tube current x rotation time) where the mAs determines the number of x-ray photons utilized per rotation of the CT scanner. The results of this study imply that one needs to be aware of the differences in normalized CTDI – not only between manufacturers, but also between models of CT scanners from the same manufacturer (Table 4 of this study). This study showed that the average normalized CTDI varied greatly (by a factor of 2) across all scanners from different manufacturers. The dose efficiency of the CT scanners improves as the scanners get more complex, with the number of detectors along the length of the patient increasing from four or eight to sixteen and beyond (e.g. : 4- 8- or 16- slice CT scanner). This has an impact on image quality and patient dose because the more efficient the CT scanner, the less the dose to the patient to acquire the desired image quality. The dose data in this study was collected for 96 MDCT scanners across 33 participating institutions. While the study did not focus on image quality and patient dose, it did examine scanner-specific radiation dose data across all institutions.